I've mentioned before that searching for ‘blind contemporary poet’ on Google generates results such as Homer, Milton and The Blind Poet Pub in Edinburgh, but very few currently living poets who are devoid of sight. And then you metaphorically bump into one, or rather one bumps into you, out of the blue! I received an email through this blog the other day, from somebody who had heard a broadcast on the RNIB's radio station, where another blind poet, Dave Steele and I talk to each other about our blindness and poetry. In blog post 49, Crazy Encounters of the Poetic Kind, I revealed I had crossed paths with the poet Clare Potter. Clare and I had been at Swansea university at the same time, circulated in the same group of Welsh-speaking friends, and neither of us had any idea the other wrote poetry! I was particularly moved by your poem on how blind people perceive/feel colours. I lost the majority of my vision at about 18-months-old as a result of a blood clot on the brain. I’m originally from Liverpool but having studied history and politics at University College of Swansea I moved to London in 1994 where I now live and work. I began writing poetry in 2012 and have a blog at newauthoronline.com where many of my poems can be found. That prompted me to ask Kevin whether he'd moved to London himmediately after completing his studies at Swansea University, which he had. That means he and I, and Clare Potter, were all at Swansea University at exactly the same time! At the time Kevin was at Swansea University, his guide dog was called Nixon, and I do indeed remember seeing Kevin and Nixon in the JCR — the Junior Common Room — bar. I don't think I actually talked to Kevin, though I might have given Nixon a pat. Now that I too am a blind person, I know that is not the right thing to do. Sighted people who would like to pat a guide dog should ask the person with the guide dog if they mind them patting the guide dog. 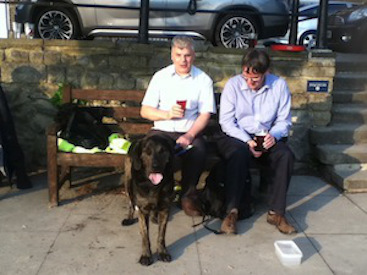 It is not good to distract a guide dog when it is wearing its harness, which means it is working, but often the owner will give permission if it is a safe situation to do so — such as in a coffee shop or at the bar in a pub. I now work for Business, Energy and Industrial Strategy (BEIS) which was, as you probably know previously known as DTI then BIS. When MAFF ceased to exist my bit of it was absorbed into DEFRA. Then, when the Department of Energy and Climate Change (DECC) was formed I became part of that Department. When Mrs May replaced David Cameron she merged DECC with BIS to form the new BEIS and I'm now part of BEIS. Let me close by sharing a couple of Kevin Morris’s poems, first is this one, ‘The Writer’s Pen’, read by him on YouTube, and I love it. And then this one, which is from his collection My Old Clock that I Wind, which is available in print and eBook formats. “My Old Clock I Wind” is a collection of 74 new and original poems by Kevin Morris. It contains both melancholy and more cheerful pieces contrasting the fact that We can enjoy life but at the same time cannot escape its inevitable end. Shall we speak as though we will go on forever? Borne on a summer’s breeze. Dance on the balmy air. The estate agent’s lights fade. Thinking on other temporary things. Its great meeting you Giles and thank you so much for mentioning me on your blog. Life is certainly full of coincidences and bumping into one another online (after all these years) is a fairly big one! I just LOVE these coincidences! I’m not sure that coincidence is the right word. You know I believe the hand of God is in all things, and I definitely believe our lives collide with others’ lives for a purpose and at a time when they are meant to do so. This was a wonderful sharing of lives. I liked the Feather poem quite a bit, too. I laughed when you said you wanted a job at the Department of Acronyms, because I was just thinking that Brits may go even more overboard on them than Americans do! well you and I differ on our belief in God, but I do believe that there is synchronicity if not coincidence behind such encounters. Deepak Chopra says coincidences mean we’re on the right path, which is true in this case. Great article Giles and what a great story about patting the guide dog. Love Kevin’s poems. Sorry, there should, of course have been a full stop after “them”.